Eating is something that we generally take for granted, especially in a country of abundance where few of us have ever faced a true scarcity of food. However, the fundamental importance of eating becomes evident to each of us at the moment we decide to see how long we can go without doing it. Stop and think about how much of our efforts are based upon the simple activity of eating. There are restaurants, their owners, those who deliver the food, people who work at grocery stores, the makers of woks, pots, pans, dishes, utensils, farmers, fisherman, producers of animal feed, fertilizers, refrigerated trucks, grills, cookbooks, milk containers, spices, diet pills, and much, much, much more. Few things (if any) have as much societal activity revolving around them as the eating of food. Perhaps that is why food is such a major theme in Scripture. When we think of food and eating in the Bible one of the first things that often comes to our mind is either dietary instructions or the spiritual discipline of abstaining from food for a short period of time (fasting). If you Google “food in the bible” almost everything that comes up at the top of the search results are some version of a bible diet. It is true that one can find some dietary instruction and some calls to fast in the Bible. However, both are “barely mentioned” in comparison to the amount of food celebrations that are there. In other words, the Bible says much more about feasting than it does about fasting. Why is that true? Because as it was noted earlier, there are few things any more universal in the human experience than eating food. Perhaps realizing the importance of food and feasting is making you a little hungry. Even better, perhaps it is creating a desire in you to extend some culinary hospitality to some friends or neighbors. If you are going to plan a feast there are two questions that will most likely be some of the first questions that you will answer. (1) Who are we going to invite? (2) What are we going to feed them? Jesus also had to answer those questions. Not only was He feasting until the end, but He left us with some specific instructions for feasting as well. What did He serve and who did He invite? The very last meal that Jesus ate was the Passover seder. Israelites had partaken of this ritualistic dinner during the Passover feast for more than a thousand years. It commemorated the Israelites’ last night in Egypt as slaves. Much of the food that is served at a Passover seder is bitter, and it helps remind the participants of the bitter life of slavery in Egypt from which they were delivered. There are six different traditional foods on a Passover seder plate. (1) There is the roasted lamb shank bone known as zeroah. It reminds the participants of the sacrificial lamb that takes away their sins. (2) There is the roasted egg known as baytsah. The egg is a symbol of mourning as the participants recall the difficult life in Egypt. (3) There is the bitter herbs known as maror. They remind the participants of the bitterness of slavery in Egypt. (4) There is a sweet, brown mixture known as charoset. While it is sweet to the taste, the appearance is meant to remind the participant of the mortar used in making bricks as slaves in Egypt. (5) There is a plain, green vegetable known as karpas. It is dipped in salt water, which represent the tears shed in Egypt as slaves. (6) There is a second bitter herb known as chazeret. It also symbolizes the bitter life of slavery in Egypt. Does that sound like the kind of food that you would choose for your last meal on earth? Not only did Jesus embrace this bitter food, but He surrounded Himself with “bitter” company as well. Jesus refers to His disciples as His friends (John 15:15), but they hardly seem like very good ones. Jesus knew that the hero of the group would disown Him three times (John 13:38), that the other disciples would run for their lives, and that one of them would outright betray Him (John 13:21, 26). Have you ever really stopped to imagine what difficult company this would have made for Jesus in His final hours? For most of us such company would have been more bitter than the Passover food described above. Yet, not only did Jesus accept their presence, He seemed genuinely comforted by them. But if that was not enough, He not only overlooked their various betrayals, He also took the opportunity to humbly serve them as well. As John put it, Jesus truly loved them to the end (John 13:1). As we come to the table it is good that we remember that Jesus did not only institute the Lord’s Supper. He instituted an incarnational presence that brought the love of God to the very core of the human experience. In the same way we are called to feast like Jesus. That is, we are called to usher the presence of God into the lives of broken people, into bitter situations, even into the lives of those who will betray us. We think of brokenness, bitterness and betrayal as opportunities to fast. However, Jesus shows us that they are in fact opportunities to feast. What kind of table is God calling you to set? Who will you invite? And what will you serve? Great treatise to show people that the feasts called by God have purpose beyond the eating. One thing: This feast is very structured, see a Haggadah, and while these elements you mention do exist, they are PART of a whole meal. 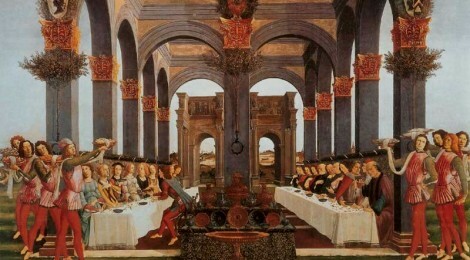 During the evening, a fairly grand meal is served and enjoyed, thus making the bitterness of the elements more bitter. This is what Paul spoke of in 1 Corinthians 11, verses 17-33. Important to know the fullness of the Passover meal to understand both concepts.